Looking to have a truly cultural Latin American experience? La Semana Santa in Ecuador is the perfect time to come to experience some of the more unique traditions in Ecuador. Holy Week in 2019 runs from Sunday, April 14th until Sunday, April 21st. If you are here in Quito during La Semana Semana, the following are 4 things the we highly recommend you experience. As one of the main festivals of the Church year, we suggest that you attend a Catholic mass for the Domingo de Ramos (Palm Sunday) on Sunday, April 14th. Ecuadorians from all over attend church this day in order to kick off the week of celebrations and to get the blessing of the church. Don´t forget to pick up your very own Palm branch on the way to the church. 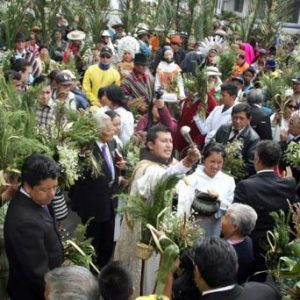 In reference to the biblical story of Jesus’ entrance into Jerusalem, Ecuadorians all buy a palm branch to set at the feet of Jesus. During the service, the priests bless the branches of each attendee. Believers then bring the branches home and where they are seen as instruments to protect the family, warding off Satan and bringing good vibes. The family saves the branches until something evil happens. At that time, they burn them so the blessed smoke will offer protection and bring the favor of God. You will have plenty of options of masses to attend during Palm Sunday, as they take place every hour start at 7:00 am until 9:00 am and 5:00 pm until 7:00pm. Vida Verde recommends that you attend a church in the Historic Center to get the best experience. Don´t forget to bring your own palm branch! You can buy them en route to the church or at any market that is near where you live. This tradition is now unique to Quito, but dates all the way back to the Roman Empire. Thousands of years ago, the tradition began as a secular service to pay homage to generals that fell in battle. During the service, the body of the fallen general was covered with a large black blanket. The same blanket was then spread out over his former troops, in order to impart the spirit and bravery of the general on to the rest of the army. The Catholic Church appropriated this tradition in order to honor Jesus, their fallen general. 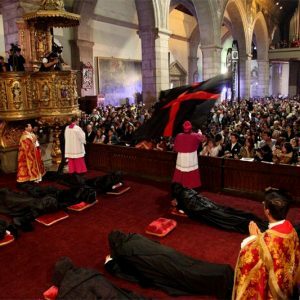 Through a special church service, believers are covered with a large black blanket in order to receive Jesus’ virtues for the coming year. The Arrastro de Caudas has been a tradition during Holy Week in Quito for over 500 years. Head to the Catedral Metropolitana de Quito at 12:00pm on Wednesday to observe or partake in the tradition. If you want to join in, head over to the Cathedral a week beforehand in order to sign up! It is a good idea to get to the church at least an hour, maybe two hours early. Viernes Santo (Good Friday) is a national holiday in Ecuador, so most businesses are closed and the streets will be filled with Ecuadorians that do not have to work on this Friday of the Semana Santa. Make your way to the church San Francisco which is located in the middle of the Historic Center for famous Procesión Jesús del Gran Poder. This procession is one of the most important events in all of Holy Week, and signifies Jesus’ journey to Golgatha where he was crucified. Starting at 11:00 am from the San Francisco Church, believers will parade around the Historic Center, carrying a life-size doll named Jesus Del Gran Poder, which is normally stored in the Church. Behind Jesus will be an assortment of people, all dressed in various costumes. There will be Roman soldiers, Verónicas (women representing virgins) and Jesus’s complete with wooden crosses. 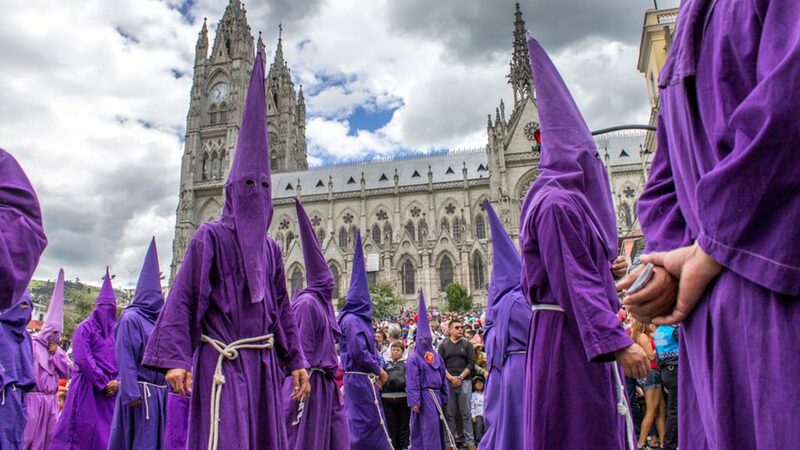 However, the most interesting and traditional costume of Ecuador will be the “cucuruchos”: believers who wear dark purple tunics with what looks like hoods from the “Klu Klux Klan”. In order to participate in the procession, it is necessary to sign-up with the San Francisco church and rent a costume for about $15 dollars. Check out the video below to see the traditional costumes! There is nothing more Ecuadorian during Holy Week in Ecuador than Fanesca. 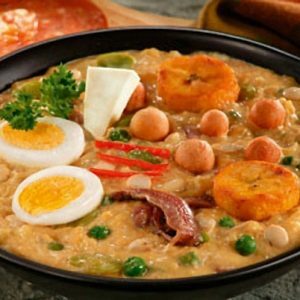 Fanesca is a dish unique to Ecuador that is served only during Lent and La Semana Santa because of the Catholic prohibition of eating red meat. The soup does not have an official recipe, but it normally includes a pumpkin puree, fish and 12 different kinds of beans to represent the 12 apostles. You can get Fanesca just about anywhere during Holy Week. It is popularly served for the midday meal. Have you been to Ecuador for Holy Week? Any traditions or celebrations that we are missing? Comment below with your favorite cultural gems during la Semana Santa. The title image came from the ILLA Experience Hotel Website.